The last few months have been a whirlwind of activity. I've been deep in the final pages of ISSNES/ Volume One, all the way to the credit spreads and back cover. Excited to be finishing this volume but anxious about the next step. Isness will be a very hard sell for publishers. It falls deep between the genre creases. It misses the mark for the currently held concepts of graphic novel or even independent/alternative graphic novel. The Indie comics community shies away form anything photographed, which is an entire subject unto it's own and well discussed here and in other places. Isness is not a photography book either. Nor is it an an artists book. It's not a real magazine, even though it's designed to have the look and feel of one. It's sort of none-of-the-above... just floating around, in a sphere of its own. 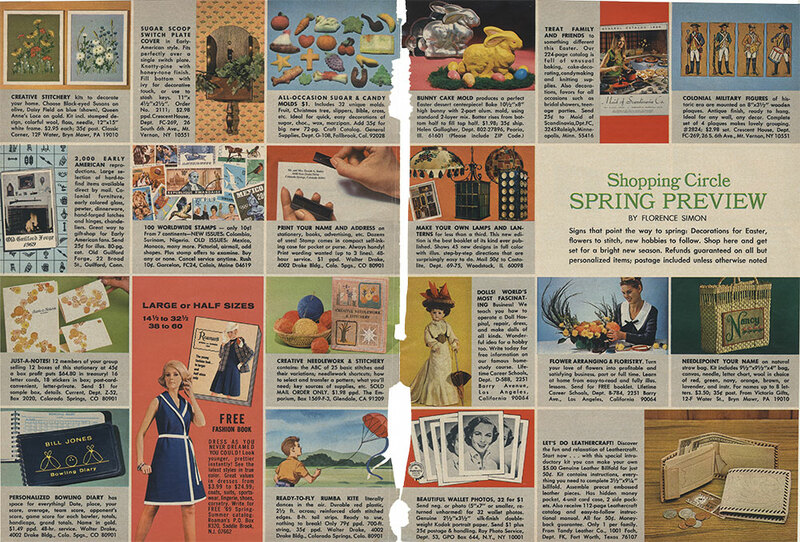 The general layout for the production credits is loosely based on the advertisement layout below (I believe it's from Family Circle Magazine) The grid of squares was very popular in 60's magazines. I've seen it in ads, recipe instructions, makeup demos and handyman tutorials. It's really everywhere... and I love it. The credits are still very incomplete, awaiting bios from the individuals in question. I'm closing in on a uniform treatment for the speech balloons. Nothing seems to do the job and still look integral to the project. It looks like I will settle on simplicity and conformity. A familiar comics trope in a sea of broken rules. More comfortable with Photoshop, I'm beginning to introduce multiple blurred images as indication of movement. We shot Pachouli-Rose-Blossom (or whatever her name will end up being, because nothing really stick for me) with a lot of in-camera blur for this scene which was a great idea in hindsight and multiplying them adds even more of that dizzying presence I wanted to give her. 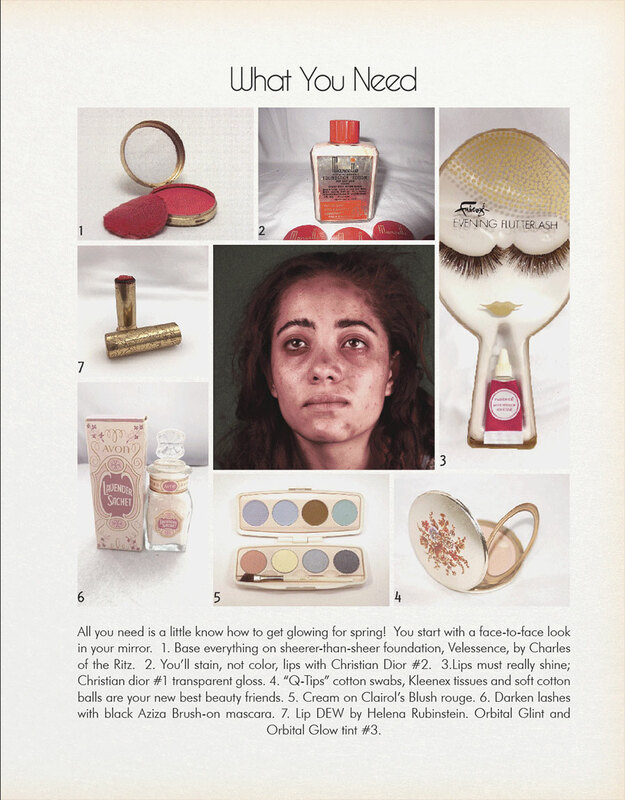 Cosmetics are an important part of the story and this very realistic 60's magazine beautifying instructive works well for my character's predicament: Poor nutrition and hygiene have left her skin a minefield of blemishes. 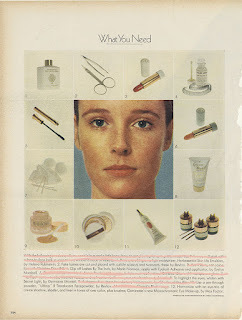 Her mother has complete monopoly in the house on any and all cosmetics. This makes them even more coveted and desirable and sets a course for Pachouli's stealing, hiding and lying. I finally finished Lars' darkroom and put him in it. That's where we leave him at the end of Volume One. In the beginning of Volume Two, he will be developing and printing a certain photo which will trigger an extensive flashback. A flip-book is also part of the activity pages and it's more complicated to design than I thought. The bonus however, is that if it works, the stills will suddenly and briefly turn into a real movie! The biggest treat, though, has been getting Lars' song off the ground with the help of composer Tamar Muskal and multi-instrumentalist/arranger Rob Schwimmer. Tamar's bold composition establishes that Isness indeed is a musical. Rob is stacking track after track to strengthen the dreamy-optimistic-almost heroic mood of the song. 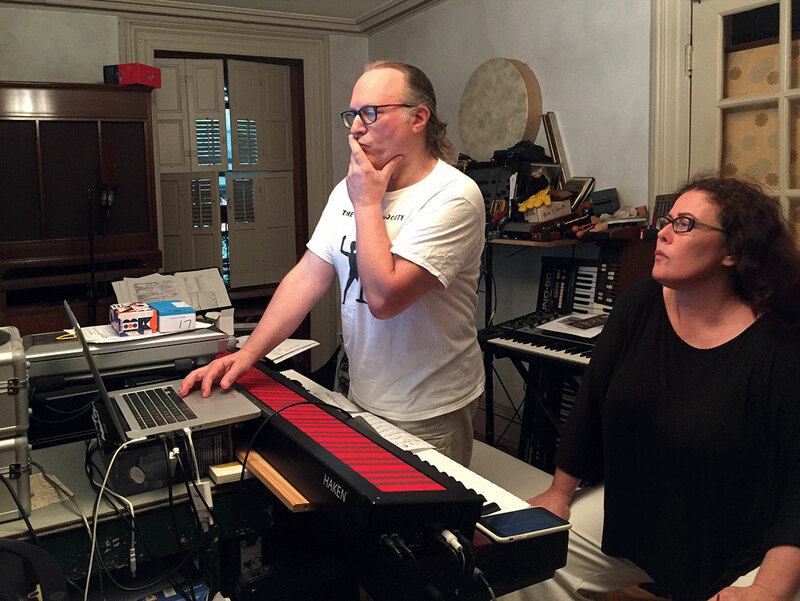 We found an amazing singer to portray Lars' young voice and are very close to recording. On a separate note, my first foray into film, Cooking with Connie, won Best Experimental Film at the Brooklyn Film Festival last month. It was an extremely pleasant shock and a real boost. Here's the review it got in Unseen Films. While Cooking with Connie took less than a year - if I don't count the inactive gaps - ISNESS is already in it's seventh's year of intense work. It's a little confusing to me that film is turning out to be the easier of the two mediums... When I launched the work on Isness I was told by a local figure in the comics world, that I was lazy. That I wanted to just go "click" a camera and have the work be done for me, instead of sitting down and drawing. Seems laughable now, though at the time it stung deeply. The near future for Isness will include finalizing edits and readying Volume One for submissions to publishers. I may decide to print a few "beta books" for this process, because I believe the project lives best as a tangible object. As soon as I can I will begin to post pages from Volume Two. Many are already laid out. Meanwhile, a sweet summer to all of you, especially to all those artists slaving over their passion projects in dark and obscure corners of the world.